This entry was posted on October 27, 2013 at 7:38 pm and is filed under Books I've Read, Favorite Things, Politics. You can follow any responses to this entry through the RSS 2.0 feed. You can leave a response, or trackback from your own site. I love the book because it’s so convincingly unreal. I’ve never experienced real life the way it’s portrayed in the novel. The novel is amazingly and consistently bleak. Government’s attempts to monitor and control life in the real world are “comedy gold” by comparison. I agree with you that it’s a classic because of influence. 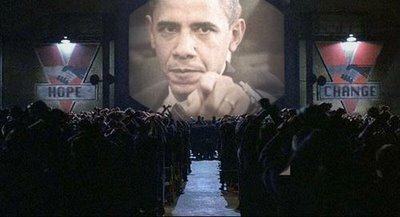 The concepts and terms Big Brother, Room 101, the Thought Police, thoughtcrime, unperson, memory hole (oblivion), doublethink (simultaneously holding and believing contradictory beliefs) and Newspeak (ideological language) have become common phrases for denoting totalitarian authority. Doublespeak and groupthink are both deliberate elaborations of doublethink.